Dr. Liviu Olteanu, Secretary General of the AIDLR was invited by H.E. ADAMA DIENG, United Nations Under-Secretary-General, Special Adviser to the Secretary General on the Prevention of Genocide, to take part in the launch by the Secretary-General of the United Nations, ANTONIO GUTERRES, on 14 July 2017, of the Plan of Action for Religious Leaders and Actors to Prevent Incitement to Violence that Could Lead to Atrocity Crimes. This event witnessed a coming together of Member States, the United Nations, international and non-governmental organizations and faith actors to adopt the Plan of Action and related regional action plans and to discuss strategies for their implementation. (…). His Excellency Adama Dieng wrote in his letter to Dr. Olteanu: “I believe that implementation of the Plan of Action will also serve to advance the Secretary-General’s prevention agenda, and is most likely to succeed with the full support of relevant United Nations entities and other stakeholders. I very much hope you will accept the invitation to be the keynote speaker at the reception in the evening. I look forward to seeing you at the launch of the Plan of Action”. 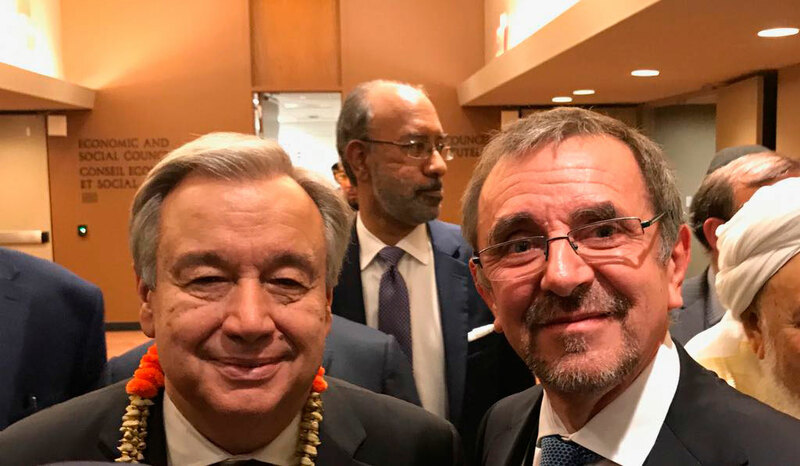 Following the launch of The Plan of Action, the Secretary General of the United Nations, Antonio GUTERRES, met with Religious Leaders and worldwide Actors. In one of these discussions, Dr. Liviu Olteanu and the UN Secretary-General, the Honorable ANTONIO GUTERRES, talked together on the Plan of Action and specifically regarding the tools produced by the AIDLR to defend religious liberty, prevent violence in the name of religion and to work in favor of the principle of freedom of religion or belief for all people. Two of these tools introduced to the UN Secretary General are: the journal “Ambassadors for Liberty, Hope and Peace” and the book “Agents and Ambassadors for Peace”. Dr. Liviu Olteanu offered a copy of the journal and the book to H.E. Antonio Guterres and both were much appreciated.